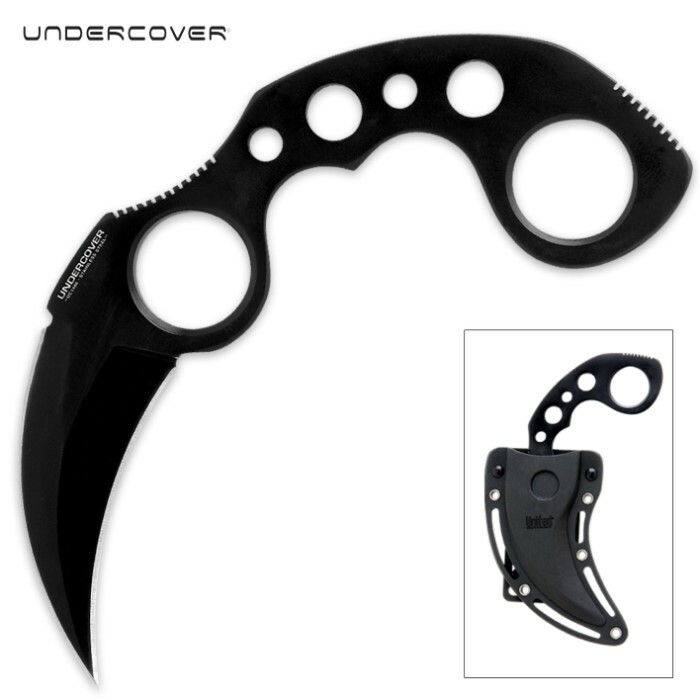 United Cutlery Undercover Black Karambit Dagger Knife | BUDK.com - Knives & Swords At The Lowest Prices! 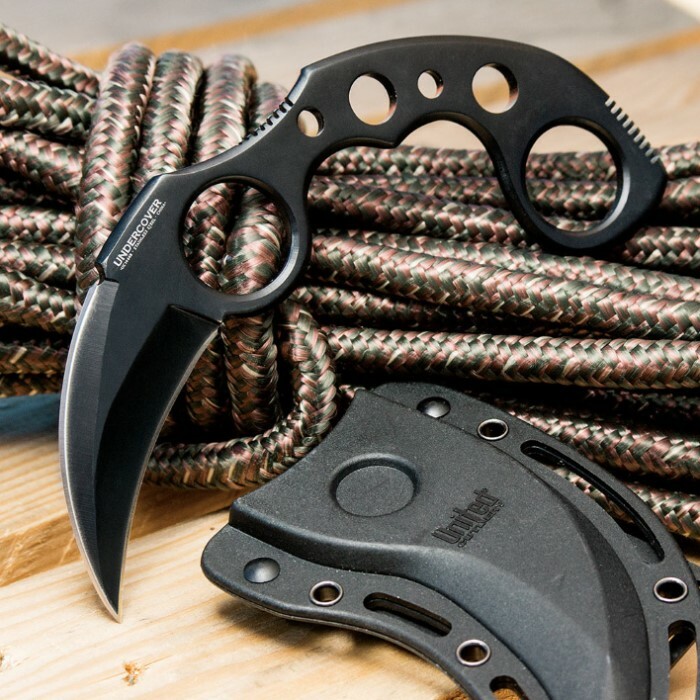 Offering a compact size and discreet carry options, Undercover karambits are easy to conceal and offer powerful personal protection that won't let you down. Mine came in very sharp. I have many Karambits but wanted a smaller one for work. This fit the bill. I use it every day now and it seems to hold an edge pretty well. Definitely worth 13 dollars. I may get the stonewashed one as well for the price. I had bought the 13 inch stilleto knives from ebay but two of the three had issues with the blade and handle so I needed a knife that doubles for utility and defense for off hand combat. This fits the bill! The knife is sharp right from the box and double edged! I had requested the engraving to be done and I love it! I do want to point out that I still sharpen my knives a bit more precise by preference once they come in since it can never be too sharp! ;) Lastly, it is better to loop the belt through the holster instead of sliding it on but like someone said, you can reinforce it with paracord to avoid it coming off. Awesome job Budk! This is my new GO TO blade. *****FIVE STARS***** Only 2 things I want to mention. The belt 'clip' for the sheath should have a different design so that you don't have to unfasten your belt to secure it but also to keep it attached when deploying the knife. The sheath itself though has excellent retention to keep the knife secure if wearing it as a neck knife. Second, I plan on wrapping paracord around the handle for a little bit more 'comfort'. All in all, I am super happy with this purchase. THANK YOU BUDK and United Cutlery. I look forward to many other purchases!!! This is the only karambit I've trusted. Secure lock in hand and a no nonsense approach is what caught my attention and for good reason...it works. When I got this blade it was a sharp tip and not sharp at all but I sharpened it up with my gerber sharpener. 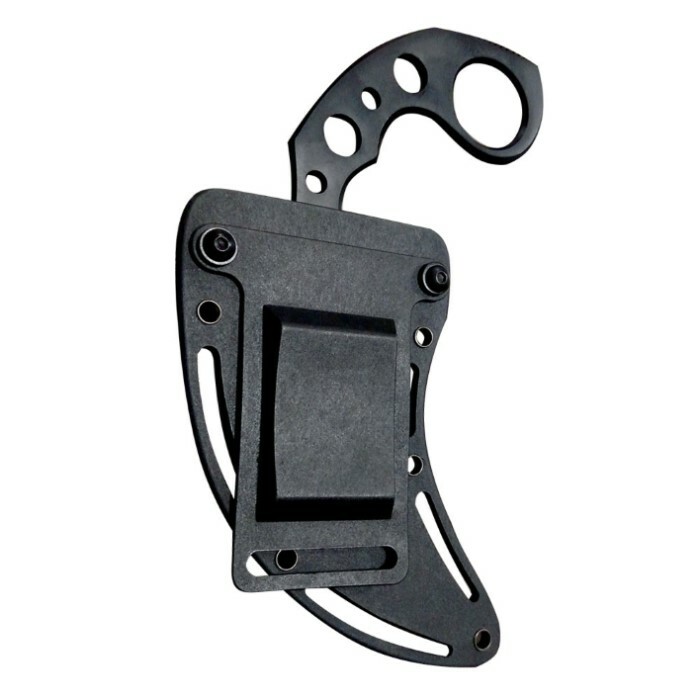 I love the karambit knife style but the comfortable grip is not so comfortable lmao, but it makes up for it with its uniqueness with the duel holes for your pointer finger and pinky. The sheith isn't so great though it broke were the holster hooks up to the belt but paracord fixes that, so I'm leaving this with a four star rating! I love everything about this knife. I wear it all the time and i just the love the feeling of the draw as well as how it fits into my hand. the only problem is the belt loop. I originally bought one, but one day i stood up and it caught on the chair and the belt loop snapped. No more belt loop; so i just went out and bought a whole new knife. So now i have a knife that sits in my draw as a back up just in case i lose the new one now. But recently I just broke that belt buckle doing the same thing as the last time, standing up from a chair. Now i have two knives and i am not able to carry them on my person, and I just cant go out and buy a new one. So I spent some time looking for a replacement belt loop but to no avail. and that is the main reason as to why it has lost a star. Wish it was possible to order a replacement loop, then that would make this all the better. So the knife is definitely a 5 out of 5. And as I said, my only problem is that belt loop. Good knife, yes was dull. Sharpened it with carbide sharpener. It is single edged and check local laws before making double edged,you might make it illegal. I am no martial arts expert. I chose two of these as my EDC daily carry and they are exactly what I wanted. These are perfect for starting with and I modified mine to what I felt would suit me best. can easily be given a decent edge. I used an angle grinder and finishing stones to angle my blades to where I wanted. wicked tough. I also modified the sheeths for inside the belt carry. These definately will do some damage to anyone who comes at you if needed. And the price is attainable for almost anyone.